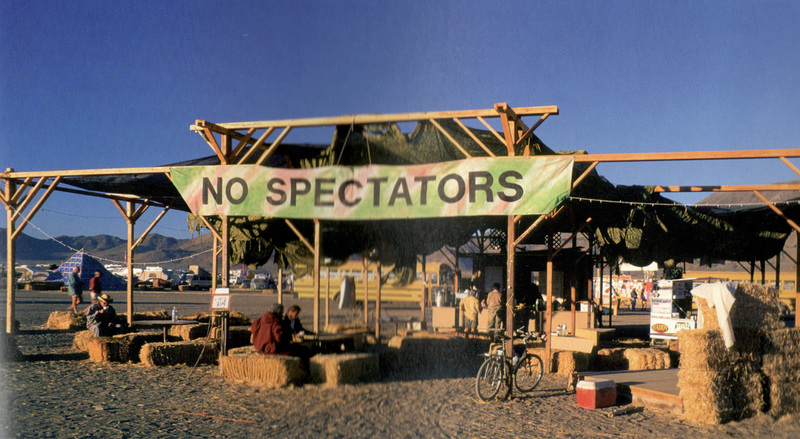 In 1990, when I arrived on the Black Rock Desert with the first participants and a large wooden man inside a box truck, we were equipped with the forest camping gear that we were familiar with in the mountain regions of California. Lacking any real shade, our enclosed tents became sweltering ovens in the mid-day sun, so to escape the burning afternoon heat, we crawled under our vehicles like lizards. We discovered that shade and water were the most important survival necessities on the Black Rock playa. During those early years, we were on a real frontier. You could die here. There was no cell service, the tiny town of Gerlach was 45 minutes away and Reno more than 2 hours away. We made our own rules and social codes. The first big dust storm was in 1992. The wind hit just as the Man fell. It was an eerie scene as the crowd of pale-dusted ghosts struggled thru the darkness to find their way back to their tents. 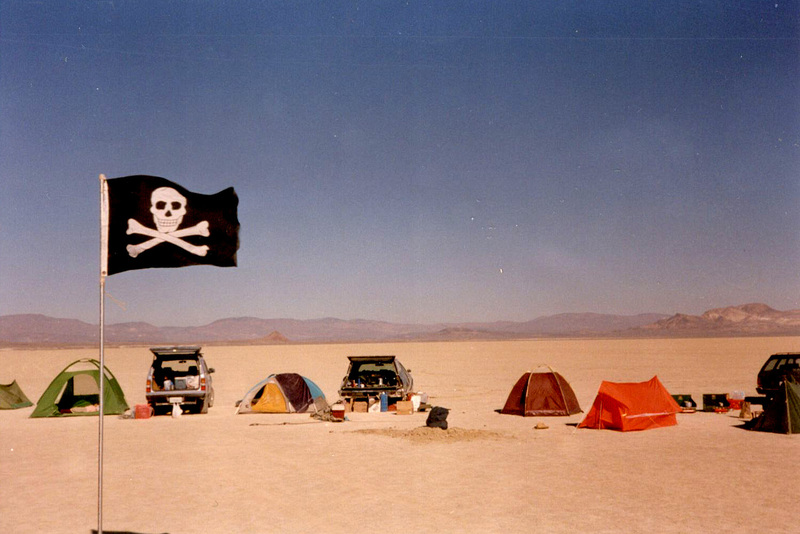 1992 was also the first year of the Black Rock Rangers, whose main job was finding lost participants out in the far reaches of the desert and bringing them back to camp. 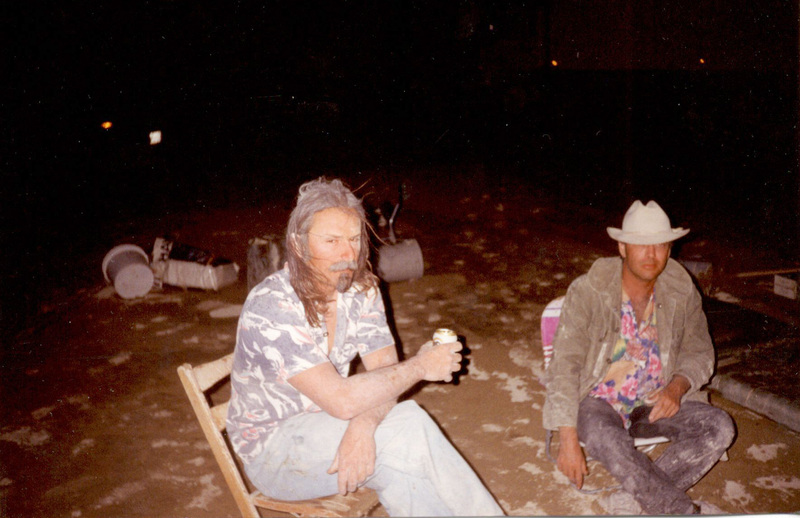 John Law & Larry Harvey in the mud after the 1993 storm. In 1993, Andy Pector brought out the first RV, an old Apollo. Two dozen participants crowded into it when a massive dust and rain storm hit, which destroyed most of the camp. During the next few years, we learned to devise various types of shade structures out of tarps and PVC pipe strapped together with bicycle tire tubes. As our need for larger areas of shade increased, we acquired some used parachutes and draped them over PVC hoops. 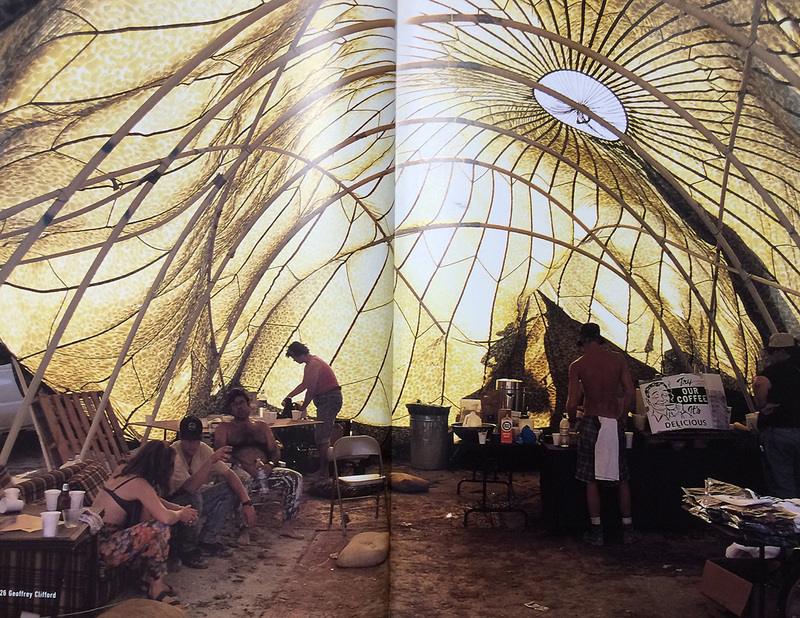 In 1995, we covered the Center Camp Cafe with a 60′ parachute. The next day we discovered that parachutes are really good for catching the wind. After that, we stopped using parachutes for shade. 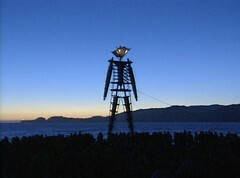 In 1997, Chicken John pulled a monumental prank by pounding several dozen pipes into the playa, which were topped with water faucets. He poured some water on the ground to make the prank more realistic. 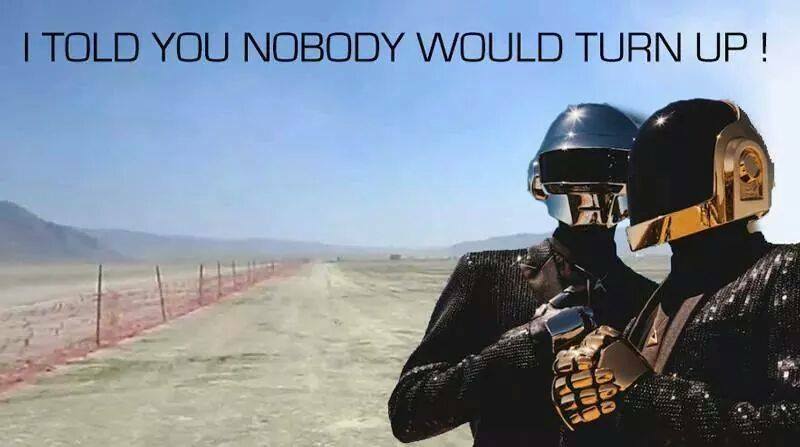 Scores of participants turned on the faucets hoping for a miracle in the desert. 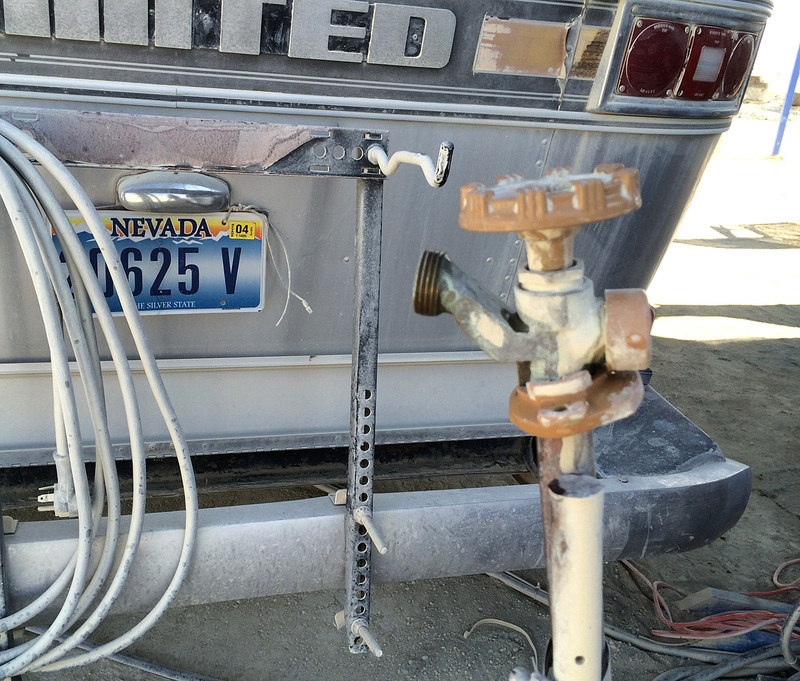 It’s ironic now that there are actual functioning fresh water faucets coming out of the playa; if you know where to look. Gradually, more and more city amenities have become the norm for staff and participants. Plug-n-Play camps are becoming more prevalent with $300,000 luxury homes on wheels- delivered fully stocked with food, costumes and bicycles. Serviced daily. 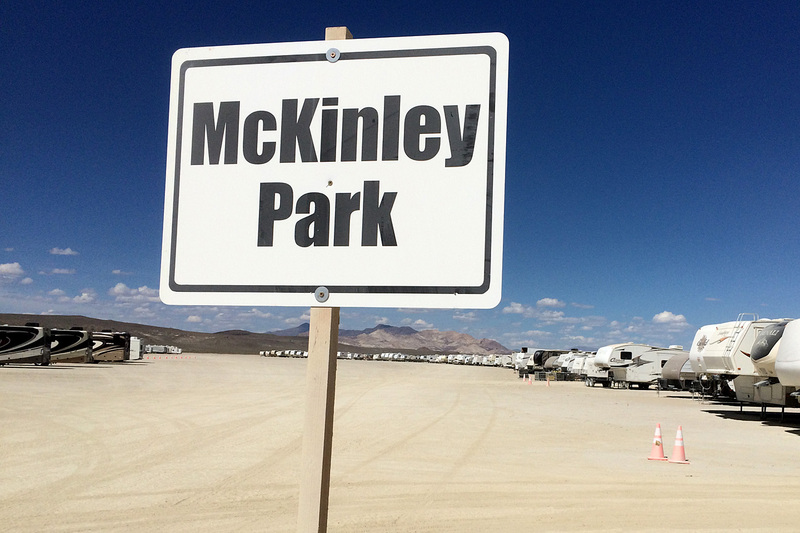 Black Rock City now has many of the amenities of a municipality found anywhere in the country. Entire blocks are electrified with generators the size of semi-trucks. There is police, a fire department and a functioning hospital on site. The expectations of it’s citizens have increased. Outside authorities have also imposed costly requirements for services that mirror those in urban areas. At what point will open-heart surgery and flush toilets be a required city service? 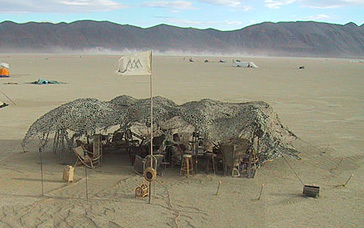 For the past 14 years, I have camped in the same place on the outer edge of Black Rock City. It’s a nice Walk-In-Camping location with a clear view of the Selenite mountain range. At The Outback, I setup my own camp and put up my own shade structure. It’s a kind of zen act of radical self-reliance. There have been years when I had a little help from my friends, but, for the most part, I am my own sherpa. This year I decided to do something different. For 2015, I decided to not build my camp and just throw myself to the mercy of the playa and sleep wherever I end up each night. 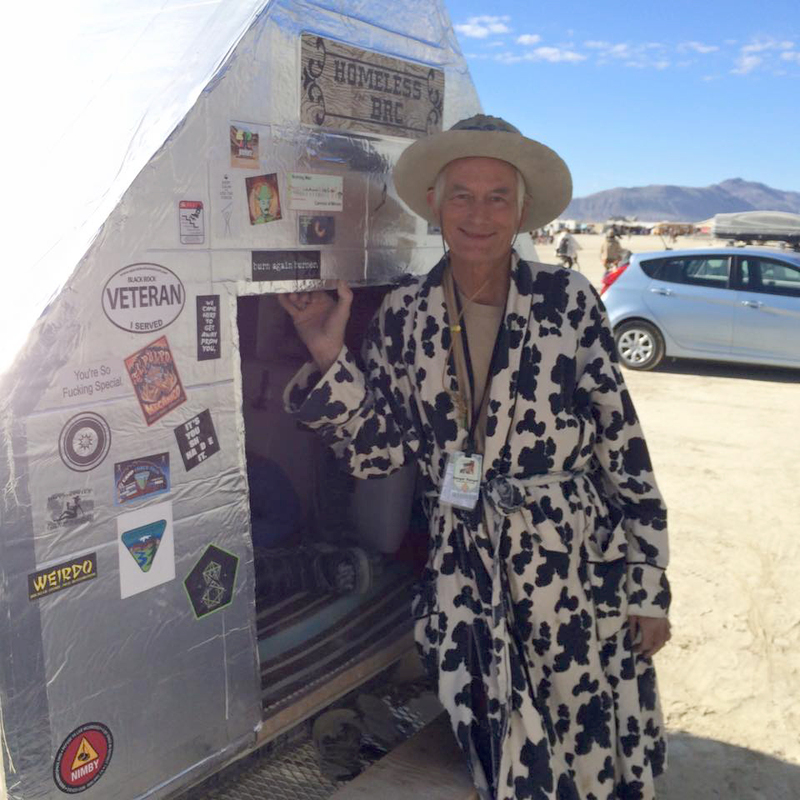 When I announced my intention to be homeless at Burning Man 2015, I received many generous invitations from members of our community to stay at their camp. There was no shortage of possible accommodations this year. 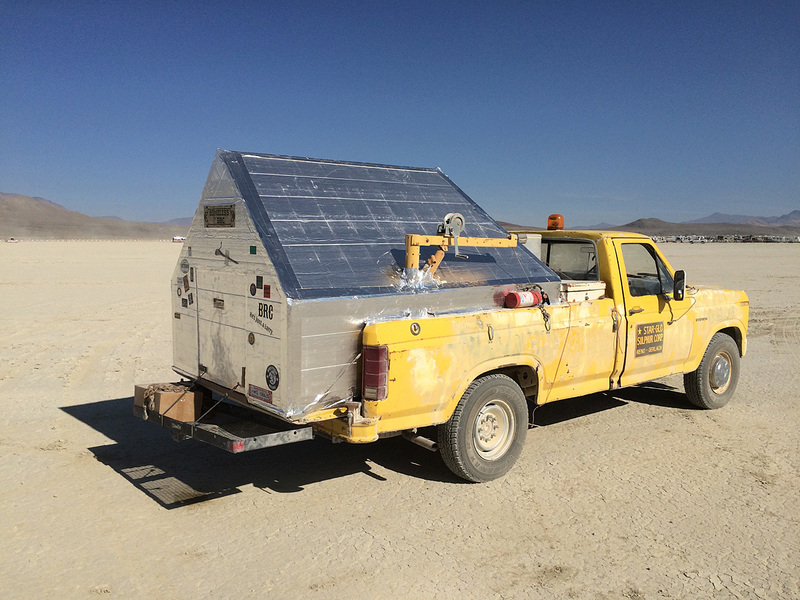 My simple preparations were to tape some insulation panels onto the back of my old desert truck (12 years at Burning Man), throw in my sleeping bag, a camp stove, some canned food and 5 gallons of liquid (some water, some whiskey). 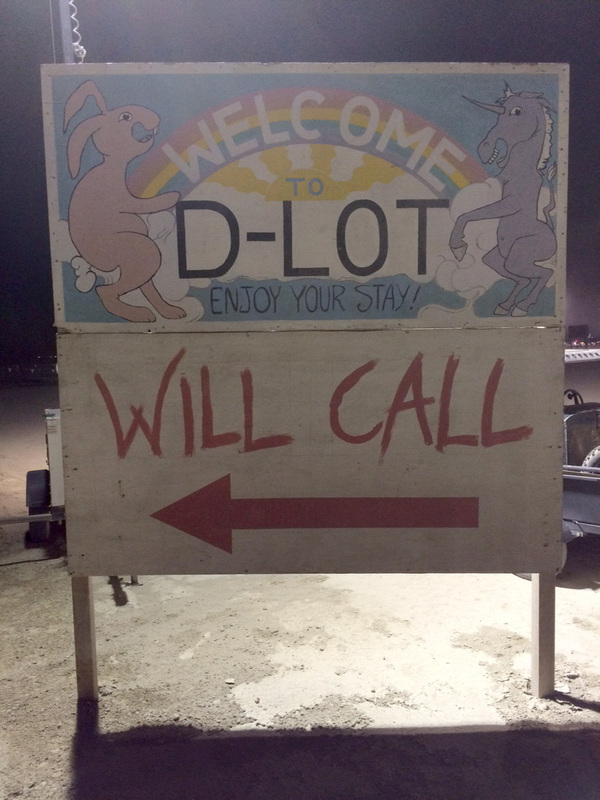 Realizing that no Burning Man experience is complete without a night spent in D-Lot, I headed out there for the Gate’s opening night festivities. It was a night of Fireworks and Clowns. The fireworks were bright and fun but the clowns were dark and threatening. I must say that I was impressed with the Gate & Box Office operations this year. The few traffic issues & entry delays that did occur, were caused by factors outside their control. Another night was spent in Martini Village, where the dinner was most excellent. Then there was that night at the Trash fence. I rediscovered the wonderful simplicity of heating a can of chili directly on the camp stove and luxuriously consuming the contents directly from the can. Another night I parked near the Keyhole in Center Camp, which made for a short stroll to the Cafe where I waited in line for morning coffee. 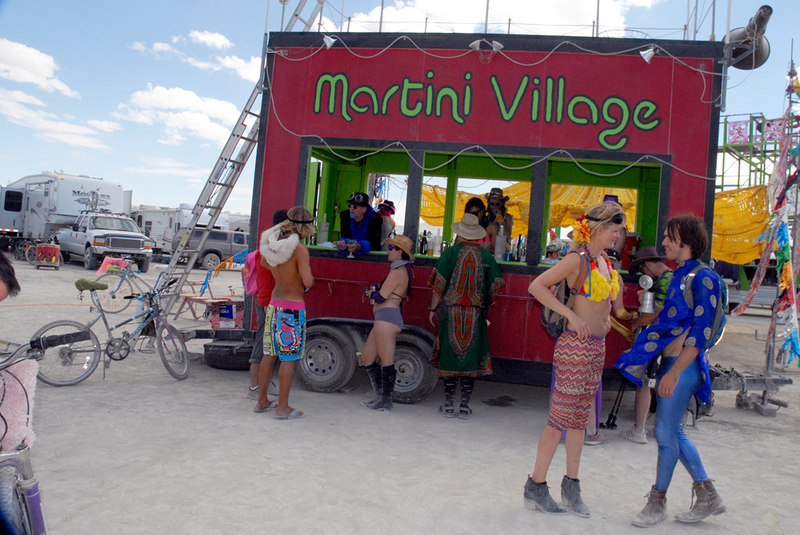 Burning Man has grown up. I’ve stayed with it because it’s still the most amazing thing that is happening on the planet. It changes peoples lives. But I fondly remember those wonderful early years when we danced around the fire like naked savages and our animal passion was unbridled. 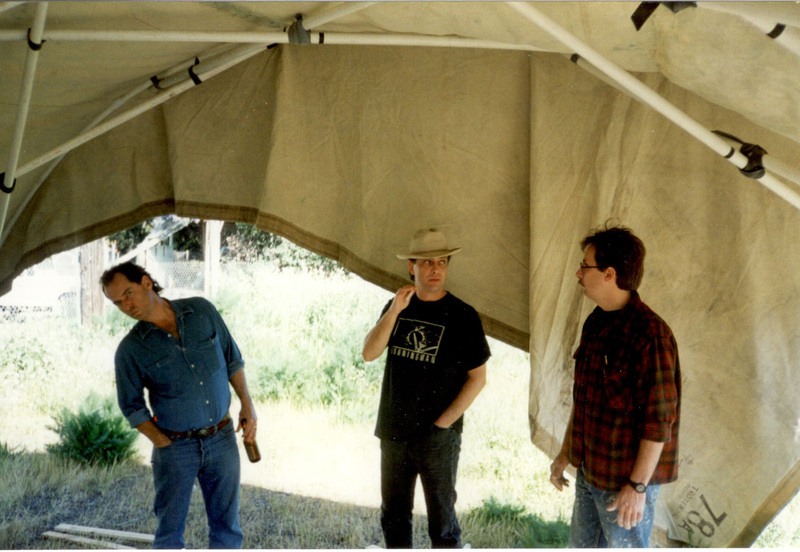 My first burn was 1993, when I hopped a flight to meet west coast friends I’d known for years but never met (we were phone phreaks & I was a not-quite-legal-adult from rural Kentucky), trusting them and their promises of sleeping bag, tent, etc. 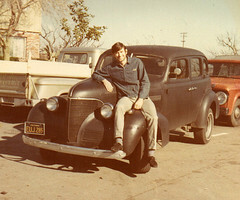 They picked me up in a ratty minivan, but it was like seeing old friends after a summer apart, and we grabbed some extra ice at a gas station and headed for the desert. Yes, we baked in the tent, and hid in the shade of the minivan, but we also danced around the musical-note-looking neon art laid out on the desert floor and suffered through Christmas caroling ;) I was hooked. Fast-forward a couple decades with a couple burns and a bunch of regionals under my belt, and I’m still coughing from a bit of bronchitis from (finally) doing my Alpha Ranger shift in the Saturday-before-gate 2015 dust storm. I remember speaking with you about the still-new-ish Rangers back in 1993 & thinking how practical it was but also how giving it was. You could have been doing anything, but you chose to deliberately deal with people who, for whatever reason, needed a hand, or at least a pointer in the right direction, or maybe just an ear. That had a big impact on me. Seeing it today and thinking of the event then, I know it’s changed, and it’s certainly bigger. But I’m glad to see you’re still proving it can be a tent or some reflectix in a truck bed, and still be about community, regardless of if a person’s definition of community is 2 people or 20,000. Thanks for being you, and being that example, even if you’re not setting out to be one.